Former Alaska Gov. Bill Walker has a new job. Walker, an attorney, this week joined the law office formerly known as Brena, Bell and Clarkson. The firm has changed its name to Brena, Bell and Walker, according to a document filed Friday in a federal case. The “Clarkson” deleted from the name is Kevin Clarkson, who left his job to work as attorney general for Walker’s successor, Republican Mike Dunleavy. Walker, 68, is a Republican-turned-independent who was elected governor in 2014. He suspended his campaign in last year’s gubernatorial race after his lieutenant governor, Democrat Byron Mallott, resigned. 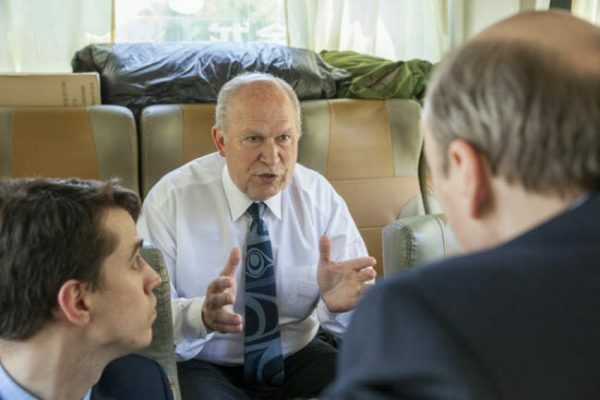 Before he was elected, Walker and his wife, Donna, ran their own law firm, where they represented the city of Valdez, along with the Alaska Gasline Port Authority — a municipal entity that was promoting construction of a gas line from the North Slope to Valdez. After Walker was elected, the firm was sold to Robin Brena, who also works on oil and gas law. Walker, in a phone interview Friday, said he expects to resume doing work for Valdez, though he declined to identify other potential clients. State corporate records show that Brena has been the sole owner of Brena, Bell and Clarkson. Walker declined to say whether he would become a part-owner of the firm. Brena was a strong political supporter of Walker’s, donating tens of thousands of dollars to political groups that backed the governor’s campaign, and candidates and causes aligned with him. While Walker has re-joined the private sector, he also hasn’t completely closed the door on his political career. In February, he reported transferring $47,000 into an account for a potential future political campaign.